With the seeming complexity of developing an app, it may appear easier to pay someone else to do it for you. However, you can avoid the cost of doing so simply by following the instructions I provide. You can create a native app that lives with all the other apps, and for the most part, it’s going to be a pitch-perfect imitation. 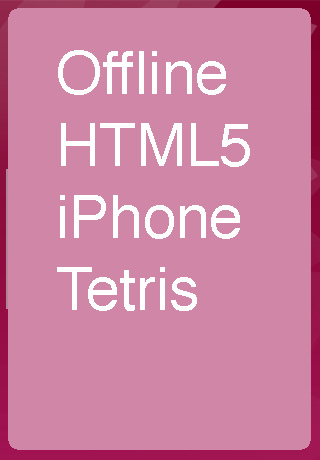 All you have to do is follow my design guidelines and you’ll have a fully functioning HTML5 iPhone app in no time! I’ll show you how to create an offline HTML5 iPhone application. 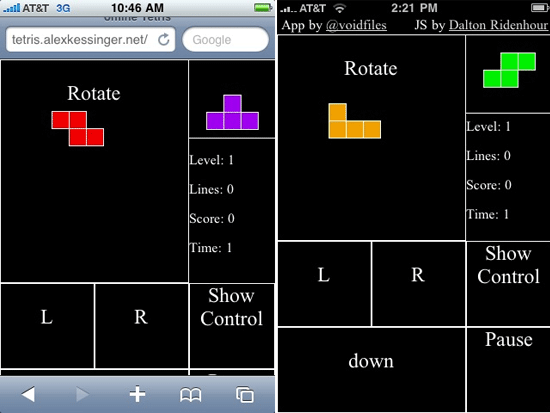 More specifically, I’ll walk you through the process of designing a Tetris game. What am I talking about when I say “offline”? Well, it means that we have a custom icon, a custom startup screen, a native look-and-feel, and you can use the app even when the phone isn’t connected to the Internet. The app should be as functional as it can when it is offline, just like normal native mobile apps. The main goal for your app is to make it as mobile-friendly as possible. This is a tutorial specifically for iPhones, but most of these techniques apply to all phones that have HTML5-capable browsers. Yeah, I mean it, check out the following image. It has no URL bar and no navigation at the bottom. It looks just like a native mobile application. You are going to need access to a server where you can change the HTTP Headers on your files. This is because we need to take advantage of HTML5’s offline caching (more on this later down the page). Apache does this really well and you can just add something to a .htaccess file and it will just work. Here’s a tutorial on modifying HTTP headers using htaccess. Once you’ve built your app, you should turn this off so that you will get the full experience when testing your HTML5 iPhone app. The icon needs to be 57px x 57px. The iPhone will round the corners of your icon, create a dropshadow, and add a shine to whatever icon you use. It should be in PNG or JPG format. Here is what I used for the tetris game. The startup screen needs to be 320px x 460px and should also be in PNG or JPG format. Here is what I used for the startup screen. Stay small, sparse and simple. Small: This is mobile app development so even though you are caching your stuff, it’s still a smart idea to keep your file sizes lean. Sparse: You should try to keep the amount of files you deal with as low as possible. Simple: Start with a few simple ideas and execute it. By keeping your scope small, you can get things done faster. This is a new standard, you can read the spec here. Application caching allows browsers to determine in advance all the files a web page will need for the web page to work. It will cache those files (to a fault, sometimes). The syntax of this file is simple: just list the locations of your files in either absolute (e.g. ) or relative to the manifest file (/picture.png). The browser will keep those files offline. You can also list a few URLs that should not be cached, but this isn’t pertinent for our offline app (if you’re interested, read about this in the documentation). One tricky part to this whole thing is that the manifest (the list of files that need to be cached offline) has to be passed with a filetype Header set to text/manifest. That is why you need access to a web server that can set HTTP headers. A quick note when designing your application: When you are in app mode, you have a screen size of 320px x 460px. When you are in web mode, it has a screen size of 320px x 356px. This can affect the user interface of your offline HTML5 app. It’s a real browser so your HTML is exactly the same. The iPhone browser is also in the forefront of HTML5, so dig into the spec. The app starts by defining your markup. 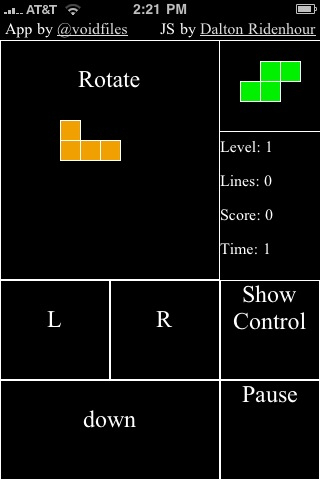 Here is the markup for my Tetris app. First, notice the Doctype. Isn’t HTML5 awesome? The manifest="cache.manifest" property on the <html> tag is how the browser knows that we want to cache this web page offline. apple-mobile-web-app-capable: This is another tip-off that we want to be an offline app. apple-mobile-web-app-status-bar-style: This hides the status bar, and nav bar when the app is offline. apple-touch-icon:This is the pointer to the image that want to be the icon. 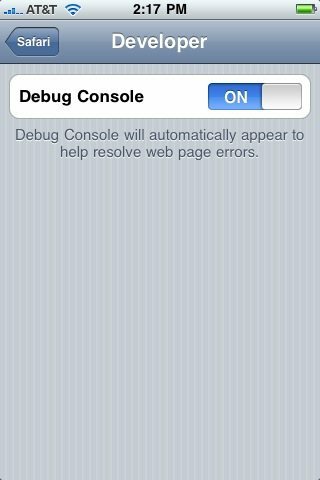 apple-touch-startup-image: This is a url pointing to the startup image. It’s almost the same as a normal web page. There are some specific -webkit CSS rules that you can use that do some really cool things like animation, but this is a quick-and-dirty guide and that’s outside of the scope of this article. The CSS is just Plain Jane. In general, JS functions work just fine on the iPhone—there are exceptions though. Think about something like a mouseover, the event exists on the iPhone, but I am not sure how helpful it is when you don’t have a standard pointing device (such as a mouse). Quirksmode posted an article about events on the iPhone that is really helpful. When you have all of that, you can test it out by opening your index.html in an iPhone, and you should be able to see everything work. Then, next step is to server it from an actual webserver that can set the proper settings on the cache.manifest. Then you could be able to add it to the home screen and have all the extras, and see the offline mode. Along with the ability to keep files that are needed offline, you can also store user data in an offline database. There are two major APIs for per user and/or per page data. The first is localStorage. localStorage, is an easy to use key-value store with a dead simple API. You can use this for storing the user’s score, for example. The second is actually an offline SQL engine, a webdatabase. The APIs are a little more advanced. Here is a little of you will see. // Insert a test Note. // Get all the notes out of the database. There is lot that can be done with offline HTML apps. Games, like tetris, are even possible, but you would probably want to consider what you want to do and make sure its right for an offline app. Quake 3 Arena, probably not. A to-do list app, definitely. iPhone offline webapps – a desk on iPhone apps.